9 Grand Champion legs and counting! Welcome to "the Rabbit Hill." 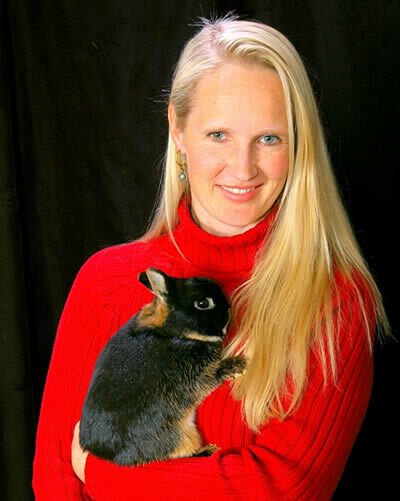 We are a small, SF Bay Area rabbitry, specializing in Holland Lop & Mini Rex dwarf rabbits. Occasionally we also have Netherland Dwarf and Jersey Woolys for adoption. 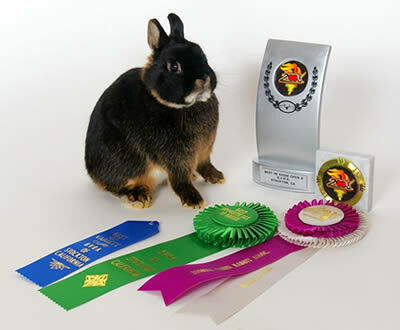 Both pet and show quality rabbits are available from grand champion breeding lines. Abyssinian, Peruvian, Texel and American Guinea Pigs are our cavy specialties. Weekly trips to our 4th and 6th grade classrooms ensure exceptionally child friendly bunnies and cavies. Grass run access and organic vegetables are a part of our daily routine. We look forward to hearing from you! I would like to thank Linda Pett, Sarah "Dione" Freeman, Candace & Meganne Vaivadas and Amy Hiroshima for all of their support, advice and the wonderful rabbits that they have all sold me. Special thanks to Tony at Miyoji Productions without whose insight this web page would not have been possible. Welcome to "The Rabbit Hill" current events column! We are a small hobby rabbitry located in the Northern California/San Francisco East Bay town of Benicia. We have purebred, dwarf Holland Lop, Mini Rex and Netherland Dwarf pet or show rabbits available for adoption. We attend American Rabbit Breeders Association rabbit shows around California and across the U.S.
Rabbit Hill's Fortuit ("chance" in French), blue otter Holland Lop jr doe wins Best Opposite of Breed for her third Grand Champion Leg. GC legs on the following rabbits: CT's Chosen One-Chestnut Netherland Dwarf sr buck (BOB), Lone Star's LS185-BEW ND sr doe, CT's Gold Dust-Black otter ND jr doe, Rabbit Hill's Black Bart-Black HL jr buck. It was a great show! Rabbit Hill's "I'm It!" black otter Netherland Dwarf wins his second BEST IN SHOW-Gridley June 2008. He now has 11 Grand Champion legs all for BOSB, BOB, or BIS!! He also has a BEST IN SHOW win from Show A at Stockton Feb 2nd, 2008. This little buck also took Best of Breed and honorable mention for BIS for Show B in Stockton and BOB and honorable mention for BIS in Show B in Santa Rosa (Jan 08). Rabbit Hill's Callie (Broken Black) jr doe places 5th, Rabbit Hill's Galactic (Broken Blue) jr buck places 29th. The Rabbit Hill places 7 rabbits in the top 10 at the 2007 Holland Lop National Show in Prescott Arizona! Upcoming Shows include the Lodi show in Nov., the Yuba City Show in Dec and the Stockton and Santa Rosa show in January 2009!